The country’s leading entertainment magazine wastes no time in 2009, reprinting 65,000 additional copies of its January 2009 issue featuring TV host and comedian Willie Revillame on the cover. YES! celebrates the new year with a bang! The country’s leading entertainment magazine wastes no time in 2009, reprinting 65,000 additional copies of its January 2009 issue featuring TV host and comedian Willie Revillame on the cover, which quickly flew off the shelves soon after its release. YES!’ new year offering perfectly captures Wowowillie’s taste for the good life, showcasing his impressive estates in Tagaytay Highlands, Corinthian Hills, Ferndale Homes, and Capitol Golf Hill, six of his luxury cars, and two yachts. YES!’ generous story on Willie takes up a whopping 48 editorial pages, easily eating up 85% of the magazine’s bulk. But the cover story is not just a mere display of the TV personality’s expensive appetites. It also offers a no-holds barred glimpse into his life both on- and off-cam, recounted candidly by this perennially controversial, yet always entertaining, figure. It’s no wonder the magazine sold like hotcakes. “The 135,000 that we initially printed was sold out in a matter of weeks since its release,” YES! Team Publisher Danio Caw relates. “Orders have still been coming in so we decided to do a reprint of 10,000 additional copies.” The additional copies were sent out on January 6. But the orders kept coming, and it didn’t hurt that Willie himself took pride in the issue. “Willie Revillame supported the issue by constantly plugging the magazine on his daily show,” Caw shares. Due to insistent clamor for the issue, Summit Media decided to publish an additional 15,000 copies, set for release on January 10. However, the additional 25,000 copies proved not enough to meet the overwhelming demand for the magazine. On January 10, Summit Media decided to print yet another 40,000 copies of the January 2009 issue, bringing the total circulation up to a grand 200,000. At an average monthly circulation of 135,000-145,000, YES! reigns as the leading entertainment glossy in the country. ”To be able to reach a total of 200,000 is truly a sign that YES! is the most dominant entertainment magazine in the country today,” Caw says. Even YES!’ advertisers have reason to rejoice. “Our advertisers also get more than what circulation we have promised them as we continue to grow,” Caw continues. YES!’ extensive cover story on Willie Revillame, who has a reputation from shying away from lengthy interviews, bolsters the magazine’s reputation as a credible entertainment source. “The reason why we are able to get exclusive stories like these is because of the trust that celebrities have in YES!. We practice the highest standards in celebrity journalism and this is the reason for the magazine’s success year after year,” Caw says. 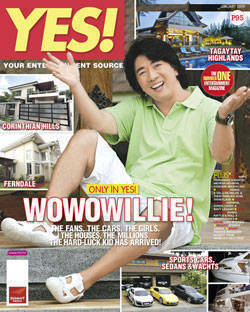 Get your copy of YES!’ January 2009 issue with Willie Revillame on the cover, in magazine stands, bookstores, supermarkets and groceries, convenience stores and department stores nationwide, and in overseas Filipino communities.